Forty years have passed since he left mankind’s last bootprint on the Moon, but Gene Cernan is a man focused on the future. He strongly believes that inspiring dreams within children, and encouraging STEM education is the path to a future where we walk on the Moon again. 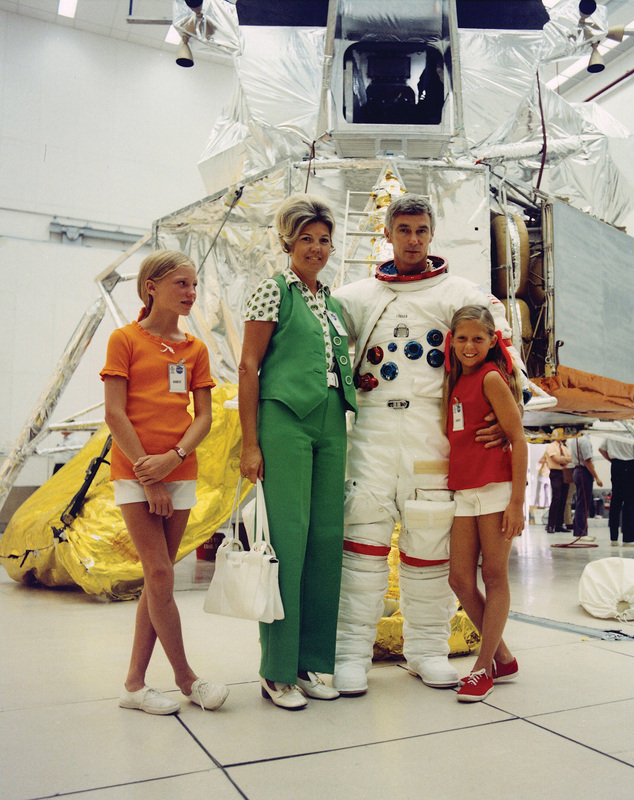 Cernan: “What we have to do is reenergize young kids’ imaginations. Challenge them to do things they didn’t think they were capable of doing. This is what real STEM programs are all about. It’s not just teaching math and science and technology. That will come. I’ve always felt that if you can get a kid’s attention, make learning fun, you can teach them, or they can learn anything along the way. That’s what our National Flight Academy down in Pensacola, (Fla.) is really all about. Using aviation as the hook. Not to make aviators out of everybody, but hopefully doctors and scientists and engineers and teachers and all the things we need so desperately in this country. “It starts with that age group, when you get a kid’s attention and they can look for something to hold onto. For my generation the challenge was not just for those in the space program, but the challenge for the country in my generation’s time, was to do something that had never been done before. To go forth to where we have never been before. And we did it. “Now we have to impart that kind of challenge, that kind of dedication and commitment into young kids and give them something that they can latch onto. “I would like to see a commitment for us to go to the Moon. I don’t care if it’s in the next 10 or 40 years. The time frame is less important than the direction we take and give this generation collectively. give my grandkids, something to challenge them, something to look forward to. Out of that challenge, and I think one of the greatest spin-offs of the space program, particularly in those early days, was education, because I have young men and young women in their 40s and 50s coming out to me today and saying ‘Captain Cernan, thank you. I am an engineer. I am a technician. I am whatever I am because of what you did.’ Well it wasn’t what I did. It was what we, the nation, did at that point and time. Since leaving the Moon for the last time in 1972, mankind has not ventured beyond low Earth orbit. For Cernan, the Apollo 17 voyage marked the end of a distinct era in space exploration. Cernan: “There are two different space programs. Both technologically, philosophically and spiritually. One is an Earth orbit. And one is when you leave this planet of ours and head out, in our case a three-day mission to make another body our home, is what we did in Apollo. It’s not different astronauts, it’s a different space program. “In Earth orbit you travel around the Earth once every hour and a half, 150, 200, 250 miles above the surface. It’s a spectacular place to be. You fly across the ocean in 15 minutes. You cross rivers and cities, and maybe even your own hometown. You see thunderstorms and hurricanes from 100 miles above them. “That’s all pretty spectacular, but let me tell you, you don’t see the Earth per se until you leave it. “When you head on out at 25,000 miles per hour and look back and realize that horizon that was only slightly curved in Earth orbit, somehow closes around upon itself, and all of a sudden you are seeing something very strange, yet very familiar, and you realize you are seeing the entire Earth emerge in your window. “It gets smaller very, very quickly as you head on out to the Moon until you can literally cover it up with something smaller than the palm of your hand. If your thumb is big enough you can cover it up with your thumb. You no longer fly over rivers and coastlines and cities and hometowns, but you can glance and look, without even turning your head, from what I call the turquoise blues of the Caribbean across the East Coast of the United States, across North America, the plains, the snow covered mountains into the deep dark blues of the Pacific. “It’s over-poweringly beautiful because its surrounded by what I call the infinite blackness – endlessness of space and the endlessness of time. Not darkness, but blackness. There’s three dimensional blackness that I can guarantee you does exists because I saw it with my own eyes. And yet within this blackness, three dimensionally, is a dynamic, kinetic moving living Earth dominated by the blues of the oceans and the whites of the snow and the clouds. Using NASA’s Kepler orbiting telescope, astronomers recently announced an estimate that there are at least 17 billion Earth-sized planets just within the Milky Way galaxy. The possibility of life existing elsewhere in the galaxy, and perhaps within our own solar system, is a topic that has been getting serious discussion in recent years. Cernan: “I saw that in the paper myself this morning, and how little we know. How little we know even of our own galaxy. I mean since I was in grade school, there’s been what, I don’t know how many planets anymore, because Pluto was a planet and now its not a planet. Now we’re saying there’s other Earth-like planets in our galaxy. Everyday, every time we reach out, we learn something new. Discovery is what it is all about. Curiosity is the essence of human existence. “Who are we? Where are we? Are we here alone? And the answer to your question is, statistically there has to be, how many, a billion, a trillion other planets like us in the infinite universe? I don’t know. But if you believe as I do that there has to be a creator in the universe, how can we, you and I, be so arrogant to believe that the creator created life here and not somewhere else? Think about that. Will we ever find out? I don’t know. I’d like to know. When the time comes that humans venture back out beyond low Earth orbit, Cernan has a few pieces of advice for those explorers. “The major advice my dad gave me a long time ago…’Whatever it is, you do your best. You’re not going to be better than everyone at everything, but someday you’re going to surprise yourself.’ You have to have enough confidence in yourself. You have to know that you are capable. You have to have a lot of faith in the people who put the hardware together that you’re flying. You can’t do everything yourself. You need a lot of help. With the in-development Space Launch System rocket potentially bringing new life to the engines that powered the Saturn V, we wondered how Cernan felt about that. The answer was illuminating. Cernan: “It was a great, great, great machine. It’s nice to know that we can go back and use that technology that we’ve already developed. It’s a shame that we’ve got three, what were operational Saturn Vs, sitting in museums. I hate to see that, but that’s the way it is. “From a simplistic point of view, there’s only one way to get into orbit. There’s only one way to get into space. You don’t have to be overly sophisticated. I think the Shuttle was probably the greatest flying machine we’ve ever designed, built and flown. But it’s not what you do on the way, it’s what you do when you get there. “You could have a big dumb firecracker get you to where you wanted to go. The time, whether it is the 11 minutes to get into orbit, or whether its the three days to get to the Moon, is, I won’t say wasted time, because we did a lot on those three days to the Moon and back, but that’s not the objective. “The objective is to get where you want to go and then use all your technology, all your sophistication, and put them all in that package. Having said that, you’ve got to make that firecracker I’m talking about safe. You’ve got to make it manageable. In our case, if we lost a guidance on the Saturn V, one switch and I’m flying 7.6 million pounds of thrust. I’ve got the capability in the palm of my hand. I almost dared it do that, because I knew I could’ve flown it into orbit. “I don’t want to get one sided, but to me, the objective is to be there. The purpose of us going to the Moon was to be there. “The SLS, let me just say this about it. We’re rebuilding another gigantic capability to put heavy payloads not just in orbit, but perhaps as far away as the Moon. But I think realistically, when we talk about going beyond the Moon, that chemical propulsion is at its limit. We have to find ion propulsion, nuclear, we have to find something else that can get us beyond the Moon. With today’s chemical technology we’d have to use the planets and coast to Mars. Nine months to get there and stay there for some extraordinary period of time until the planets got aligned so we can get home. That’s unacceptable to me. That won’t happen. When we go, we’ll be able to get there in 60 days or less, stay as long as we want, and come home when we want. It’s going to take some sophisticated new propulsion technology to do that. 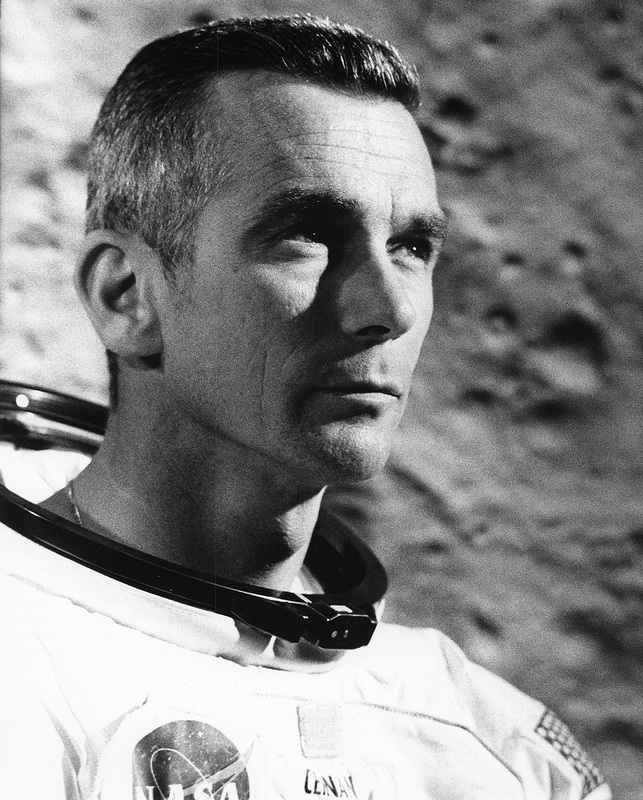 Nearing his last moments on the actual surface of the Moon, Cernan knelt down and scratched ‘TDC’, his daughter’s initials, into the lunar soil. It was a simple action that still resonates with children to this day. But why did he do it? Cernan: “I tend to do things ad lib. I think about things ahead of time, but for the most part I react to the environment, I react to the moment. I had no plans to do that. It just seemed like the thing I ought to do at the time. I parked the rover, about ready to walk back to the LEM and I don’t know, I just did it, and I can’t tell you why. “I guess I thought it would be nice to have her initials up there, and people have said ‘How long will they be there?’ I tell them as long as the flag will be there. As long as my final footsteps will be there. Forever. However long forever is. And that’s something none of us can understand. That’s a concept of time. As the conversation was drawing to a close, Cernan reflected on the need once more to inspire the next generation growing up today. 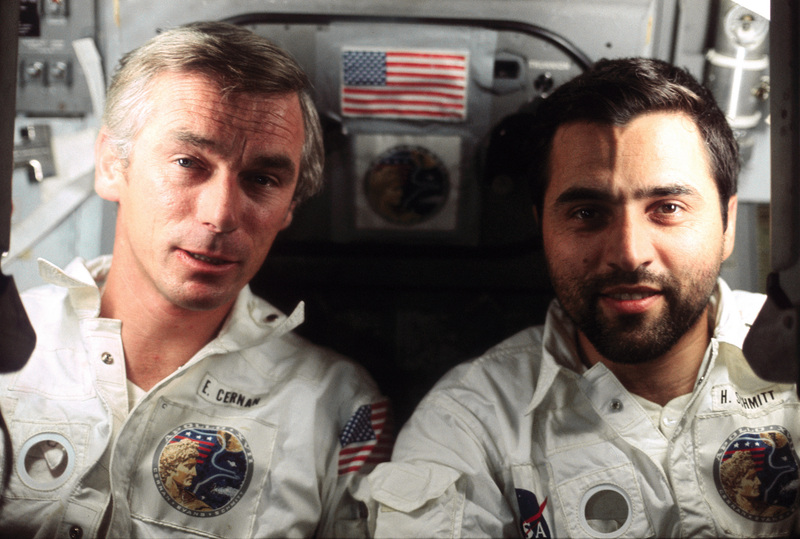 Cernan: “Going back to the Flight Academy. That’s where the future is. The future is in our kids and we’ve got to give them something. We’ve got to give them some self reliance and some self confidence and something to reach out for. Something that they can feel good about. Apollo 17’s Gene Cernan and Harrison Schmitt recently spent more than a half hour apiece discussing a variety of topics with RocketSTEM. The phone interviews were conducted by Chase Clark, with assistance from Anthony Fitch. The conversations have been edited for length.